Those who used to follow my blog over on LiveJournal may remember that for several years now I’ve done a list of suggested gifts you could give to someone you didn’t like very much, but had to buy a gift for anyway. I’ve actually never run into this problem myself, but I know an awful lot of people who seem to have it, and as an unfailingly supportive and sympathetic friend, I wanted to be helpful. There are a couple of principles that hold true every year. 2. Cheapness but not OBVIOUS cheapness. For instance, if you want to give someone a bottle of terrible wine, people know that Charles Shaw wine is only $3 (or $2 in California? I’m not sure). The big cheap brands (Koala Ranch, Yellow Tail, Barefoot) are also both too recognizable and too likely to be drinkable. But if you look, you’ll be able to find a $5 bottle that’s from a totally obscure vineyard. To maximize the odds of it being terrible, go to a wine store with a good selection and tell the wineseller that you want a bottle of wine for no more than $5 and that it has to have a cork, not a screw-top, and it has to NOT be from a recognizable cheap brand, and that you REALLY don’t care if it’s drinkable because it’s actually a prop for a play or a video you’re making. (Don’t tell them it’s a gift. There are loads of perfectly drinkable $5 wines out there and they will show you straight to those if they know it’s a gift.) If they think that no one will ACTUALLY be drinking the wine, you’ll probably get a surprised look and then, “Oh, well. If you REALLY don’t care how it tastes, how about…” and they’ll hand you some hideous crime against grapes, hopefully with a unique, attractive label and then just add a wine gift bag and you are SET. So there were three specific options I wanted to highlight for you this year. 1. The Worst of Etsy. Of course, there’s plenty of upcycled stuff that’s cool. Not everything with “hipster” in its description will be an aesthetic nightmare. And in point of fact I’m a fan of steampunk. But if you search for “upcycled salvaged hipster steampunk” you’ll probably find at least a few items that will make wonder WHY, WHY WOULD ANYONE DO THIS, WHY WOULD ANYONE BUY THIS except as a gift to their least-favorite relative? Just don’t overpay. The great thing about gifting a hand-made item — well, the first great thing about gifting a hand-made item is that no one will expect a gift receipt. But the OTHER great thing is that you can give something that’s really cheap but not OBVIOUSLY cheap and they don’t have any good way to figure out what you paid for it. And yes, I’m wimping out of providing links to hilariously awful stuff on Etsy and I’m using the excuse that it could be gone by the time you go look, but really it’s that I don’t want to hurt the feelings of the craftspeople selling this stuff (and I live in fear of them following the link back and then telling me about how they’re selling these hand-crafted recycled license plate bracelets because they’re trying to keep from losing their house or whatever.) Etelka’s got loads of links and pictures, if you go look at her blog. I’m much more comfortable linking to stuff on Amazon. 2. The Cheapest of Amazon. I stumbled across this the other evening and was sort of freaked by it. This stuff is not necessarily BAD for gifting (I linked to it on Facebook and several people immediately followed the links and bought some stocking-stuffers) but it is so disconcertingly cheap it caused me to start plotting a story about the jewelry which, when worn in your ears, makes you extra-vulnerable to the mind-control rays from the planet Vortol or something. Cute little owl earrings for 62 cents, free shipping. Cute little seahorse necklaces for 98 cents, free shipping. Slightly defective Eiffel Tower necklace that says “ARIS” instead of “PARIS,” 93 cents, free shipping. You’ll need a presentation box if you want it to look like you bought it from a store, which alas will run you more than 62 cents. Well, okay, they’re less than 62 cents EACH but you have to buy 20. Maybe you have one around the house that you could re-purpose. These honestly are not terrible gifts; according to the reviews, the chains that come with the necklaces are flimsy but mostly they’re cute and look basically as pictured. You could, in fact, order these for someone you liked, if you were on a budget or wanted an inexpensive stocking-stuffer. (Maybe not the “ARIS” Eiffel Tower.) But you could wrap up the box and gloat over the fact that you had spent less than a dollar on their gift. But it is also the best one-stop shop for truly godawful Christmas gifts you will ever find. I took photos. Basically the canned stuff, in a cute jar. Pie in a Jar. 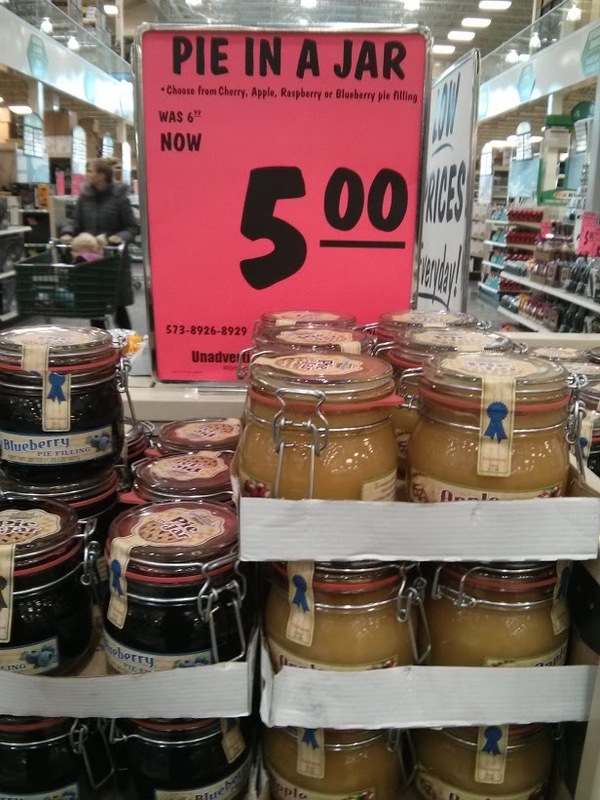 It’s…pie filling. In a jar. Just add a crust, and bake, for bad pie. There was a whole trend a few years ago in which people made their own mixes (for brownies or whatever), put them in a mason jar, and tied a ribbon around it. I don’t want to criticize this gift too harshly when it’s homemade, because for one thing is it is an extremely CHEAP gift, the sort of thing it takes minimal effort to do, and there are people who are stuck exchanging gifts with a lot of people. They might even be people they like, and they want to give them SOMEthing, and in that case — yeah, mix in a jar? fine. Anyway. The excellent thing about this gift is that it’s probably going to be genuinely terrible pie but it comes in a cute little jar (I don’t know the term for the sort of jar with the springs in the lid, but they’re definitely in the “cute jar” category) and looks gift-like. Go for it. 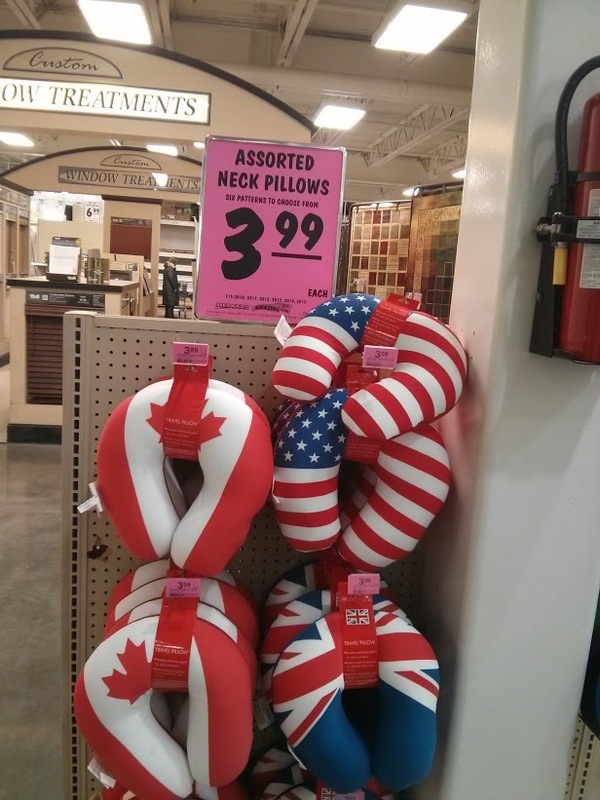 Flag neck pillows, because patriotism, I guess. Penguin, reindeer, and snowman cocoa jars. I think they actually come with hot chocolate mix in them. I recognize this design, sort of. There are eight gazillion penguins out there that look kind of like these penguins, all with slightly sketchy features, black beady eyes, and a scarf. You find this guy as a mug for $1 at Walgreens and as a sugar bowl for $10 at Target and as earrings at Dollar General. And now he holds cocoa. The great thing about this item is that it’s too cute to just throw away, but not actually attractive enough to display. The Cocoa Penguin will lurk on the counter or in the back of the cabinet for years, taking up space, gathering dust, and making the recipient feel vaguely like he or she is being watched by a penguin. Also, they’ll wonder if they’re supposed to refill it…but unless you make your own from cocoa and milk powder and sugar, cocoa comes in a perfectly fine container already, or in envelopes in a little box. If you want to give someone you dislike a kitchen gadget for Christmas, the best options are always are either inconveniently large, or irritatingly overspecialized. This item is both. Admittedly, I don’t eat hot dogs all that often, but when I do, I find it entirely feasible to cook them in a pan on the stove. I can’t recall ever wanting to cook 12 at the same time, but if I did, I still think I could handle it with my larger frying pans or possibly a baking dish in the oven. 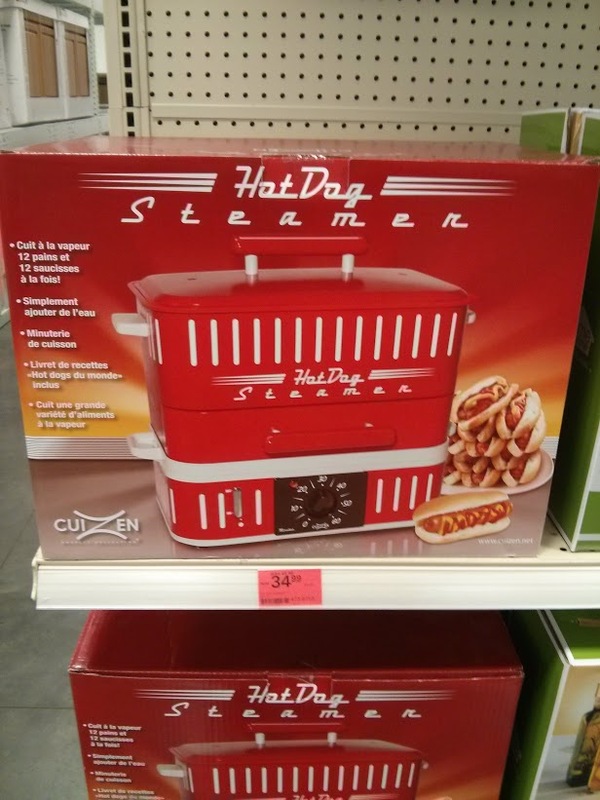 It is possible that you could use it to steam other stuff (I haven’t checked) and that someone could find a use for it beyond hot dogs, but it’s also enormous and difficult to store; I would bet money it’s a pain to clean; and it says HOT DOG STEAMER on it, suggesting that the owner is someone who eats so many hot dogs they actually need an appliance to cook a dozen at once. There probably are people who would find this useful, but even those people will likely find it annoying to store. 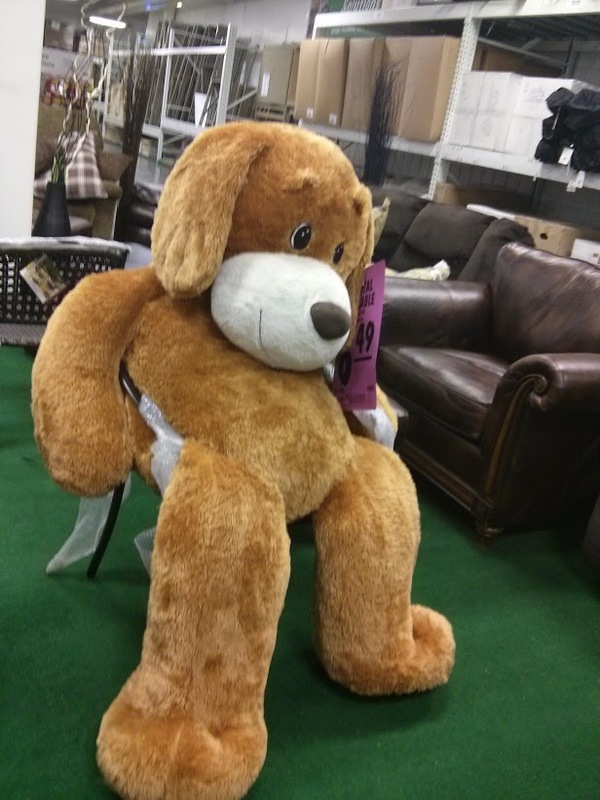 That dog is sitting in a full-sized chair, and spilling out of it. It is too heavy for a child to move easily (I pulled it off a couch, which it was sitting on with a friend, and stuffed it in that chair for the photo). This thing is ghastly. A child will think it’s the coolest thing ever. The parents will hate it. And because it is ENORMOUS, it will never be lost or misplaced; if they get rid of it while their child is at preschool one day, they will either have to fake a burglary or admit they threw the damn thing out. 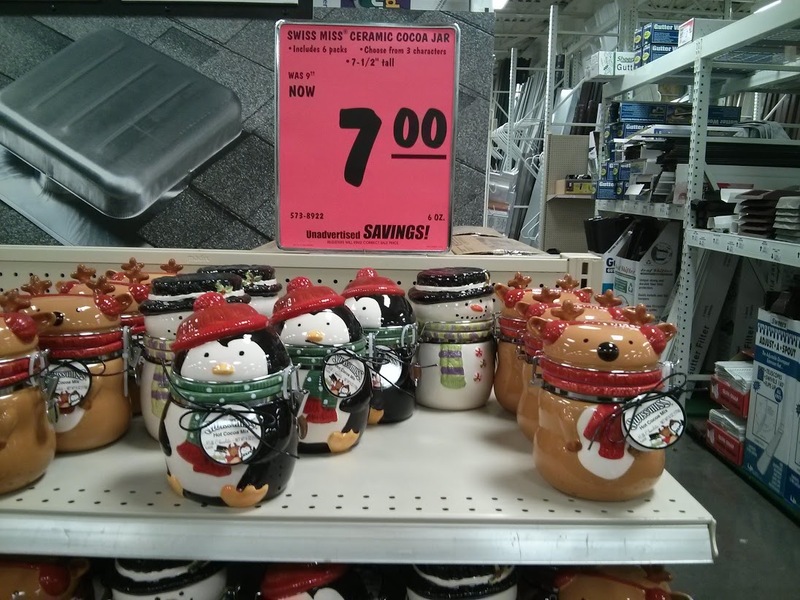 Menards also had cutesy jars of cookie mix (you could do a gift bag of both cookie mix and pie in a jar! ), scented bath products (even people who like scented bath products will probably not like the ones from Menards), and enormous sculptural things you’d put on your lawn (which alas are mostly kind of expensive). Past versions, if you’re dissatisfied with your options on this post and want to look back through previous ideas.